Mark Jeffers has been training with a world champion ahead of his ninth professional contest in Bolton on Saturday night. 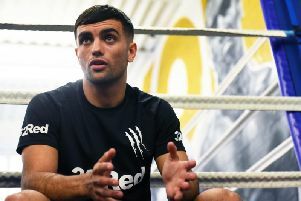 The unbeaten Eccleston middleweight, based at Jennings Gym in Coppull, has been sparring with WBA super middleweight belt holder Rocky Fielding in preparation for his fight at the University of Bolton Stadium. Jeffers, 8-0 with one knockout on his record, has been helping the popular Liverpudlian prepare for his blockbuster bout with Mexican great Saul ‘Canelo’ Alvarez at Madison Square Garden in New York on December 15. The 20-year-old has impressed when sharing a ring with Fielding and is an apt sparring partner given the tongue-in-cheek ‘Chorley Canelo’ moniker given to him by some. “It’s been a great learning experience for Mark,” said Dave Jennings, part of Jeffers’ team. “Rocky has been really happy with what he’s done. “He’s obviously not winning all the rounds, far from it, he’s in with a world champion but he held his own. “The ‘Chorley Canelo’ thing has come up before and he’s actually Mark’s favourite fighter. This Saturday night Jeffers will face durable veteran Alistair Warren who ran former world title challenger Brian Rose close on the Blackpool man’s return to the ring earlier this month. “He will come looking for a fight hopefully,” said Jennings. “Mark hasn’t had an easy apprenticeship at all and has fought some real stalwarts of the scene. “He’s not got loads of stoppages but is still getting his man strength. “He’s a lad of 20 fighting 35-year-old men who do everything they can not to get stopped. Jennings insists it is a case of the prospect moving slowly but surely through the ranks having turned professional earlier than most. “We could get carried away and just chuck him in,” said the trainer, who runs the Coppull gym with brother Michael. “But once you jump up in levels there’s no coming back so we want to make sure he’s more than ready. “He’s only 20 years old, we’ve got to keep reminding ourselves of that. “He’s not even had an eight-rounder yet. This will probably be his last at six before we move on.